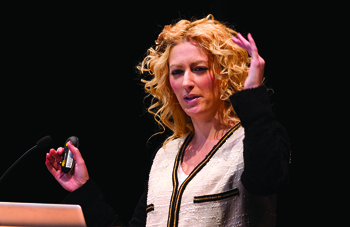 The Cooper Series brought Jane McGonigal, an award-winning game designer and author of Reality is Broken: Why Games Make Us Better and How They Can Change the World, to campus on Nov. 14 and 15. One of McGonigal’s candidates for harnessing super powers is the game “Re-Mission,” developed in Palo Alto’s HopeLab. At first it looks like any teenage shooter-game, but players control a nanobot that combats leukemia, dashing through twists and turns in a virtual human immune system. Younger cancer patients are known to struggle with adherence to chemotherapy regimes. But after just two hours of playing “Re-Mission,” patients showed a strong commitment to their drug regimen six months later. Long after the game, these same young people reported much higher rates of self-efficacy and felt empowered to beat their cancer. Combining video games with neuroscience, McGonigal flashed the audience an MRI image of someone immersed in a game. The brain’s thalamus and hippocampus were aglow. McGonigal noted, “No brain-dead zombie-ness happening here.” The scan, she stressed, is the brain of “Super-Empowered Hopeful Individuals.” Her raw optimism set the tone for her presentation, which may be one reason McGonigal is known for top TED talks. McGonigal emphasized that video games are designed around the premise that players can eventually win. When it comes to solving real-world problems, like bad protein folds, gamers, who are highly collaborative and have excellent spatial intelligence, are better than computers. Players of the game “FoldIt” discovered geometrical folds for stable proteins, and gained a byline or an article in Nature. Gamers, McGonigal insisted, can translate their skills for dealing with apocalyptic scenarios on their screens and address the “pretty epic” challenges we see in real life. Working with The World Bank, McGonigal designed an online course for developing business skills in sub-Saharan Africa, titled Evoke: A Crash Course in Saving the World. The course centered around an interactive graphic novel set 10 years in the future. As the game progressed, hypothetical famine broke out in Tokyo, Londoners suffered cholera, and an energy crisis swept Rio de Janeiro. The world turned to young and entrepreneurial Africans for help. The game eventually enrolled nearly 20,000 players from more than 130 countries. Every student received a “social innovator” certificate from The World Bank Institute, and 50 business models received funding through the Clinton Global Initiative. One winning group, now known as Libraries Across Africa, initiated the world’s first library franchise, after dreaming up a library system that could spread across the developing world as fast as McDonald’s. With the help of the NYPL staff, a medieval bookbinder in Brooklyn, and 10,000 eager applicants, McGonigal and 500 gamers pulled an all-nighter to construct 100 Ways to Make History, Vol. I. The book now appears in the Rare Books Collection, alongside copies of the Declaration of Independence and the Gutenberg Bible. In a follow-up after her talk, McGonigal sat down with students in the Lang Center for Civic and Social Responsibility. After discussing the personal motivation she’s witnessed among gamers, McGonigal fielded a question about game addiction in South Korea. There’s a real “aspirational aspect in the culture,” she said. “It’s subversive to opt into artificial reality,” yet gamers replicate this quest for “self-advancement” as they climb the ranks of their game. The trick is bringing that capacity for self-advancement back to reality.